Can Google Apps Crumble Microsoft’s Office Foundation? Google is heading into the new year with a new set of enterprise customers, the result of moves made this year to revamp its cloud-based productivity applications. For years, Google has been infiltrating areas beyond its core search business. This was the first year it was able to make real headway with large-scale customer adoption for its collaboration software, though, Amit Singh, vice president and head of enterprise at Google, said an interview with All Things D.
The Google Apps lineup, which allows businesses to write and edit documents; communicate via e-mail, chat and video; and collaborate on other office tasks, made significant gains this year. The cloud-based applications are accessible from anywhere, so an employee doesn’t have to install software or stick to one office computer. The company also launched Google Drive, which allows users to store documents in the cloud, and Compute Engine, a Infrastructure-as-a-Service cloud platform designed to compete with Amazon. With the productivity software upgrades, Google was able to land several new enterprise customers, including Dillards, Office Depot, Costco, Kohl’s, Roche and BBVA. While promising for Google, the company’s success in enterprise software could be bad news for Microsoft, the current leader in the space. Microsoft’s e-mail client and document services have long been the trusted business software necessities. 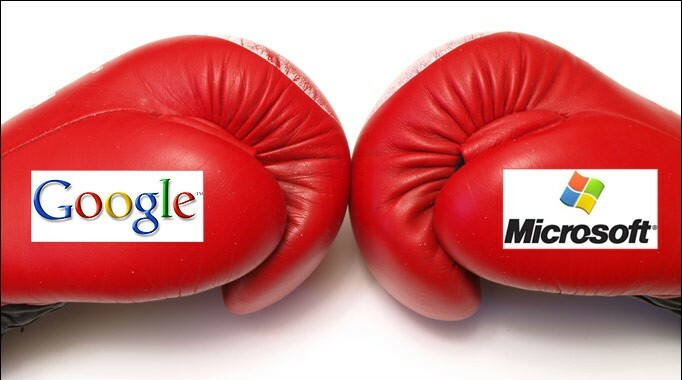 Price is a main area in which Google outshines Microsoft. While some large businesses can buy Microsoft offices in discount bulk prices, the 2013 version of Office is listed as US$400 per computer. Microsoft Office 365, its cloud-based service, starts at $72 annually per user. Most companies then add features, including e-mail, for an additional cost. Google charges $50 per person for its enterprise services, and that price covers everything. The ability to work remotely, or not have to deal with pricey or complicated software updates, is also one of Google’s big advantages, said Jeff Kagan, tech analyst and consultant. Even though Microsoft followed suit with its launch of SkyDrive earlier this year, Google’s Web-based applications make it the leader of the pack for the inevitable transition to the cloud, Kagan pointed out. Google is no stranger to driving market transitions, though, and the company is ready to ride out the move to the cloud and be there for the massive enterprise adoption, said Kagan. “Google can continue to focus on and transform every major market like they have been doing successfully,” he pointed out. Google is so confident in its enterprise offerings that Singh said the company’s goal is to snag 90 percent of the users that don’t need the most advanced features of Office. While the company can no doubt make a dent in that number, such mass adoption might be optimistic for Google, said Radicati. Still, Microsoft will be hurting if it doesn’t adapt to the changing market, said Kagan, because Google and other emerging competitors are better equipped to serve customers looking to the future of the enterprise space. Google and Microsoft did not respond to our requests to comment for this story.